Fiona Batson caught up with Crispin Jones who manages Waterborn SUP, 2018’s winners of the UK SUP Club Champs. Congratulation on winning the 2018 British SUP Club Championships, what does it feel like? I’m still buzzing, it is such a fantastic achievement and I’m so proud of everyone in the team. I was told during my first year managing Waterborn not to put time into the club and focus purely on the business, so when we won that year in 2015 it meant so much to me and equally now as owner it means even more to see the hard work pay off. The level of the competition this year was also extremely high especially from the new clubs such as SUPSECT and Northern SUP Race Team. With new clubs it’s always a little bit of the unknown and I’m sure they will come back even stronger next year which will only improve the level of paddling in the UK. The day is always actions packed, what were the highlights for you this year? The team events were great fun to partake in and watch, but the Dragon finale was my highlight. A perfect photo finish between Waterborn and BaySUP who just edged ahead, that’s the type of close racing you want especially as a spectator. 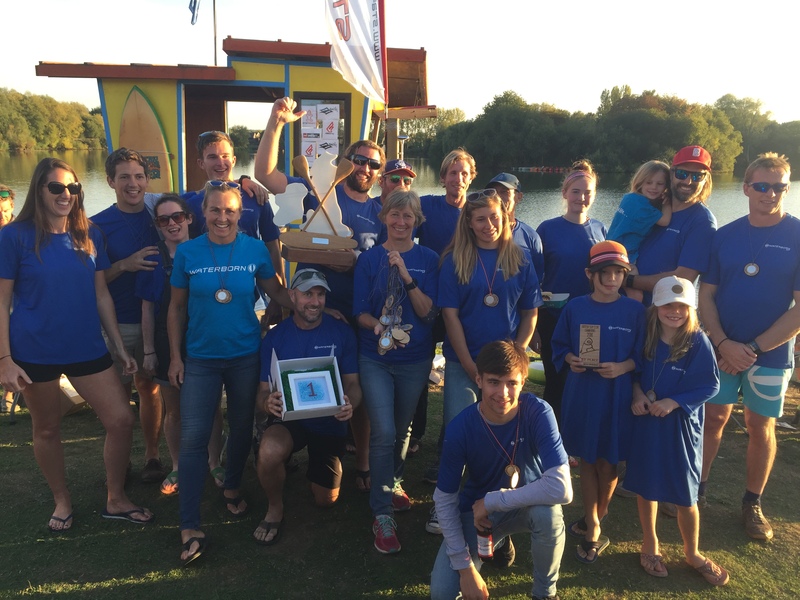 Your winning team included a number of top UK paddlers (Marie Buchanan UK’s top female paddle boarder, Starboard rider and member of Team GB, Paul Simmons, Ben Pye – winner of the Thames Crossing) – how did your team/club train for the competition? We all have busy personal lives with work, training often can be difficult but I know a lot of the guys and girls train whenever they can for events. We run a weekly training session for an hour on Wednesday nights which, alas, is now fortnightly as we lose the light in the evening so back onto Night Training. 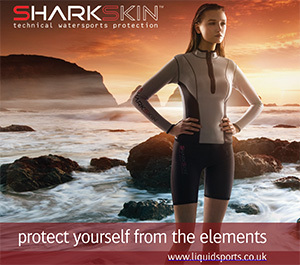 We try to include fitness sessions, sprint training, beach starts as well as the fun sessions like SUP Polo and SUPDog which actually work as a brilliant training and fitness exercise too. The likes of Marie and Ben are also hard training for European and world events and getting out at every spare minute and we wish them every ounce of success abroad representing Team GB. 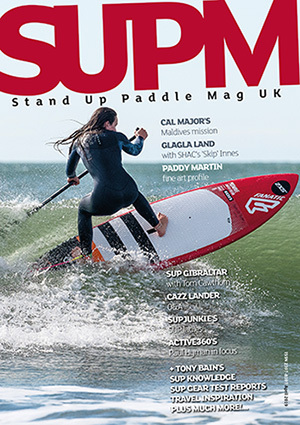 This is the 6th year of the British SUP Club Championships and sold out in just over a week. What makes it such a great event for Clubs? Either way it’s great to see how the event has grown each year and is still attracting new clubs and competitors. I think the main reason it works so well as an event though is that the whole club counts, as a sport it is very individually bias so it’s fantastic to have something everyone is looking forward to. You still have your personal reason and focus for racing but that added spur to keep you going for your team mates. Your Club Waterborn SUP is based in Kingsbridge in Devon, for those who maybe unaware, can you provide some back ground on how it started and how many members it has? We are based next to a fantastic pub called the Crabshell Inn and the business was originally set up by the pub and a guy called Ollie O’Reilly who some of you may know is now a key member of Starboard. It originally formed as KESUP (Kingsbridge Estuary Stand Up Paddle) but they renamed it to Waterborn after that first year. I took over late 2014 managing on behalf of Ollie, and in 2017 brought the business and was keen to continue to grow the club alongside the school. Our club sessions range from our weekly training, to paddle and pick (litter collection #pickitSUP) breakfast paddles and social paddles, our women’s only sessions this year have anywhere between 30 – 40 ladies all enjoying the water every fortnight on a Monday evening. We have an open membership system so you can sign up for a year for a fixed fee or you can come along when you have time for £3 a session using your own equipment or just £7 if hiring making it really easy to get involved, I would say we have around 120 club ‘members’ coming from Plymouth through to Torbay and everywhere in-between. We know there are lots of paddle boarders around the country, would you recommend paddlers join a local SUP Club and what is the benefit of doing to them in doing so? SUP is such a great social platform and you are far more likely to get out and enjoy the water if you are paddling with others, joining a local club can help you meet other likeminded people and introduce you to areas you might not have known about to paddle and that could become your new favourite SUP spot. There will also be a wealth of information available to you should you have any questions which can save hours of trawling through the internet. Most clubs tend to involve having a drink at the end of the paddle too, what’s not to like! This year saw an increase in the number of categories for novice paddlers (those who have not paddled outside of their club before) with a great turn out – if you could give them 3 pieces of advice to the novice paddler, what would that be? You are good enough to race! It doesn’t have to be about the podium spaces, most races you will find you have mini battles with other similar ability paddlers or try beating your own time from a previous year/training session. These personal battles are what racing is really about. Every race is a learning curve, you either win or learn. Take 1 piece of wisdom away from each race, did you have a good or bad start? Happy with a turn or felt you could have used hydration on the longer races, take away something that worked well or not so well and use it to make you a better paddler. Have fun! At the end of the day we are not out here to make money we are here to enjoy ourselves and make lasting memories of events. Very few people in the world make a living off racing so go and enjoy your time on the water! With the creation of GB SUP National Series this year, I know a lot of paddlers are looking forward to SUP racing in 2019 – if a novice paddler asked you why they should race / take part in other events, what would be your answer to them? The GB SUP National series is a great way of knowing what you are getting out of an event, rules, event fees, distances are consistent and designed so you don’t have to second guess what you’re up against. Paddling in different venues than you are used too will not only be a fun adventure but also great for increasing your confidence and your skill as a paddler, don’t be afraid to go out of your comfort zone, that’s where the magic happens. Learn the course, be happy you know where you’re going, not everyone in front of you knows the way! Sign up and get out on the water, just class it as going for a paddle, set your goal as completing the course and enjoy the journey. 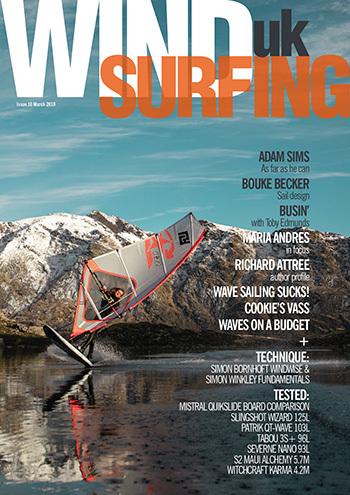 Where can you find Waterborn SUP? We are located in Kingsbridge, South Devon, TQ7 1JZ if you happen to find yourself down in the area check our Facebook page, the cover photo has our club sessions/times and as long as you can SUP you are more than welcome to join in, if you haven’t paddled before we specialise in beginners lessons, call on 07908 193632 check the website at www.waterborn.uk.com or email info@waterborn.uk.com See you on the water! Thank you Crispin for answering our questions and congratulations again on the win.